At least since I arrived in Cairo five days ago, nothing like this has happened. In fact, it may well have been the first such incident at Tahrir Square since the revolution. Around 9:30pm Saturday at Tahrir Square in Cairo, many people on the traffic island encampment suddenly rushed into the traffic. They had received word that some thugs were beating up supporters of the Egyptian revolution. People rushed in between cars to cross the street. They were headed up the street on which the American University is situated. It was a confusing situation. I snapped a picture of a seated woman who appeared very shaken. 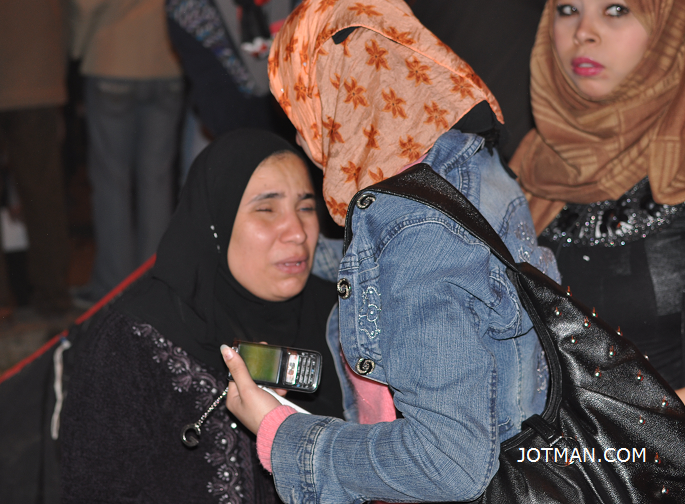 I saw two people who had been injured carried onto the Tahrir Square encampment. I was having some camera problems, so I didn't get a picture of the first -- more seriously-- injured person. But I saw the badly injured man carried to the medical tent by four men. A few minutes later I saw him lying flat on the ground outside the medical tent. Many people were crowding the small space so I left. When I returned to the medical tent, I was informed that that the man who had been lying on the ground had already been taken to a local hospital. The other injured person -- pictured in the photo below -- was carried to the tent shortly after the first. When I took this picture I was told he had bruises from being "hit with a stick." Shortly after I took this picture a person dressed head-to-toe in a black face-veil outfit tried to pull the Egyptian flag from the roof of the medical tent. There was a bit of a scuffle. My camera jammed again, so I didn't get a picture of that bizarre spectacle. Oddly, one person on the scene told me that "nothing" had just happened and that "people are just spreading rumors." Given the inconsistency of this person's inane statement with what we were presently witnessing, my interpreter suggested this person might be working for the police. In this brief video clip, an Egyptian journalist explains his theory about what happened last night. Other Egyptian protesters at Tahrir Square shared this journalist's interpretation of the incident.